Endless Overlook is located east of the Endless Stair in northern Coldharbour. 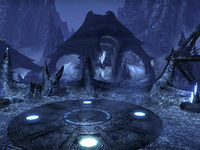 It cannot normally be accessed until you've nearly completed the Coldharbour main quests, though you can discover it early by traveling to another player in your friends list, group, or guild(s) at the Endless Stair Wayshrine. This page was last modified on 2 February 2019, at 03:26.